This dad earns his spot for his incredible endurance. The emperor penguin breeds in Antarctica, the coldest place on Earth. We're talking 72 degrees below Fahrenheit — brr! After Mom lays her egg, it's Dad's job to keep it warm. 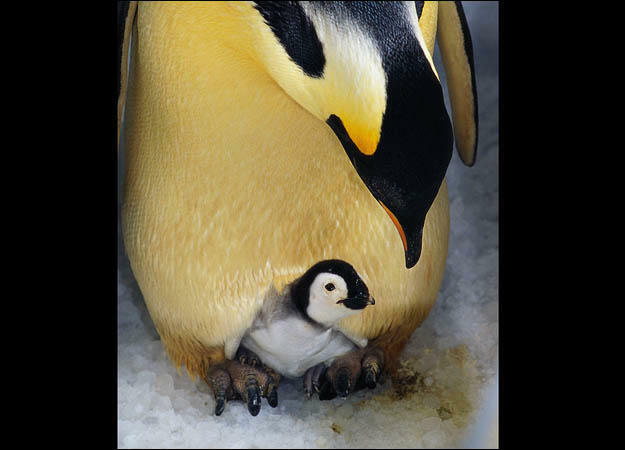 Meanwhile, the female takes a two-month feeding sabbatical while the male balances the egg on his feet in subzero weather, often forced to huddle together with other dads for warmth until their chicks hatch. Despite not having eaten for months, it's Dad who provides the baby's first meal — a milky-type substance to sustain them until Mom can return with a belly full of fish and switch the chick from "breast milk" to solids. It's role reversal at its finest!